Good morning. It was my intention to post last night, but yesterday sort of got away from me and besides, I was too cold. Our boiler has packed up and our up-to-now very mild winter has decided to take a dive for -5. Not so cold? No, probably not as cold as Canada or Siberia, but in our old, big, drafty Victorian house, it's a bit like being outside. Yesterday was a day of running around getting ready for my business trip to Tunisia on Monday (25 degrees - yay!) then a hasty trip to take my washing to my mum's. I felt like a teenager doing that but there's no way it'll be dry enough for me to pack on Sunday night if I try to dry it here - it probably wouldn't be dry by the time I get back! Then when I got home at half past 8, I was too cold to do anything but sit infront of the TV. You should have seen us, both in wooly hats, layers of jumpers and fleeces and a hoody, thick socks and slippers and covered in a blanket. We gave up and went to bed early, under layers of blankets and still in the wooly hat! I'm now sitting here in my nightwear - fleece, thick socks and wooly hat included - too cold to get in the shower or get changed, though I have to at some point as I've heard John Lewis is having a half price sale on fabrics such as Amy Butler and Joel Dewberry (I'm not not sure that's his name! It's the cold, I have frostbite of the brain!) and I have vouchers!! Don't panic about the wordy-ness of this post - I do have photos! Not many though, it's been to cold to make anything. First up is my TAST for week 2. This week was buttonhole stitch - a stitch I know as blanket stitch and have done plenty of. 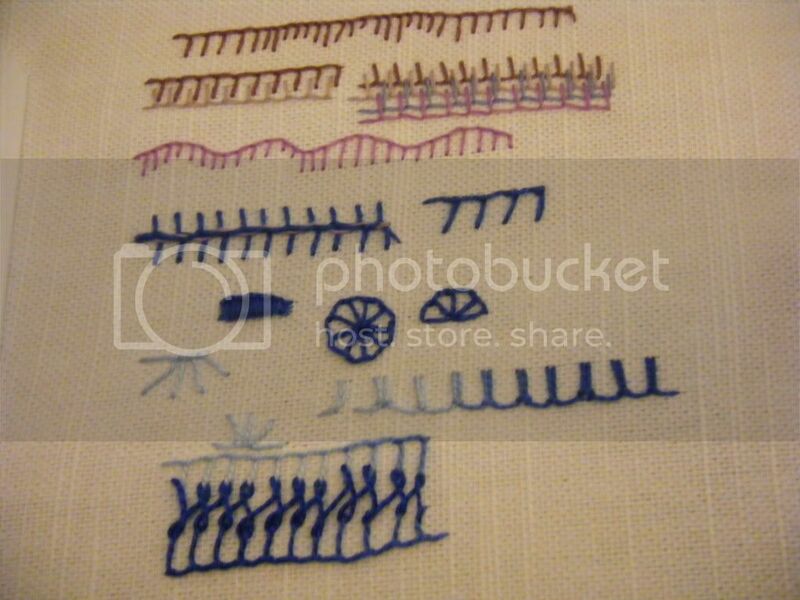 I enjoyed trying out some different versions of the stitch, but my work below looks a little pathetic! I'm such a slow embroiderer. I had a go at the ideas on Sharon's post, including overlapping blanket stitch, barb stitch (though you can't see the whipping, I only used 2 strands and I think I needed more), up and down button hole stitch (it's like a little miracle, it doesn't look like it's going to work but it does! Love that one), some very unsuccessful circles and a knotted buttonhole which I don't think you can make out above. I then turned to my Crazy Quilting book and had a go at the bottom stitch which is laced buttonhole. My stitches are incredibly wonky, but I think it'd look great if I practiced some more. That's all I've got to show you in the way of craftwork, but I do have a giveaway win and a purchase to show you. I've been quite lucky with giveaway wins recently, I won a $50 gift certificate for a handmade jewellery shop in Sew Mama Sew's countdown to Christmas giveaways - though sadly it has never materialised... I've also won two stitching kits which I'll show you when they arrive and I won the book below in the SMS giveaway day. It came courtesy of Kopeckys. Oh! Nearly forgot, I also won two PDF patterns from Jojoebi which I'll show you when I've made them! And my purchase? Well I've made a few, but the most interesting is this Hoopla Yarn. Which I'm going to make a doily rug with - as soon as I find the pattern which I KNOW is in one of my recent magazines - can anyone point me in the right direction? Its -15C here right now (-24C with the windchill) - our furnace is running full tilt - brrrrrrrrrrrrr!! Congrats about your SMS wins (I won a pattern, which I've already received) - you should let SMS know about the one that didn't send your certificate - maybe they won't let them participate again. Not nice! Have fun in Tunisia - maybe you could take your laundry there and hang it outside to dry, LOL!! Oh no - sorry to hear about the boiler - that sounds like a nightmare. At least you have toasty Tunisia coming up soon. I didn't know there was a free pattern floating around. Would be interested to hear how you get on with the hoopla yarn as tha yarn my pattern recommends is v difficult to get over here. 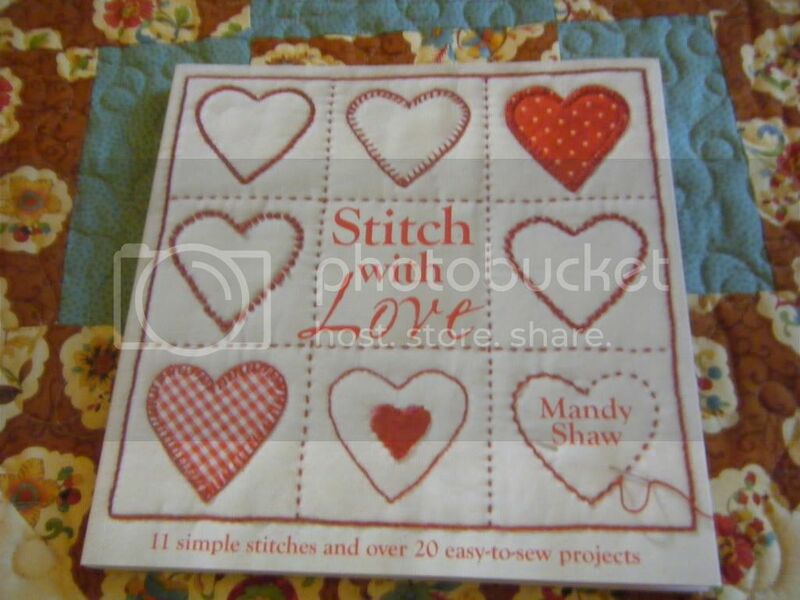 "Stitch with Love" book, cute stitchery patterns and projects in it. Safe travels! Keep warm girlfriend! So hard to stitch when fingers are freezing! Congrat's on all your wins! Egads - sorry to hear your house is so cold - mine is too, I have four layers on right now. No boiler trouble, just a cheap hubby. Your stitches look great, congrats on your wins [I hope that one shows up!]! Enjoy yourself in Tunisia and take pictures! Yarn project perfect for the cooler weather. It is about to turn very hot here - Enjoy the sun on your trip. Hope they don't make you work too hard. 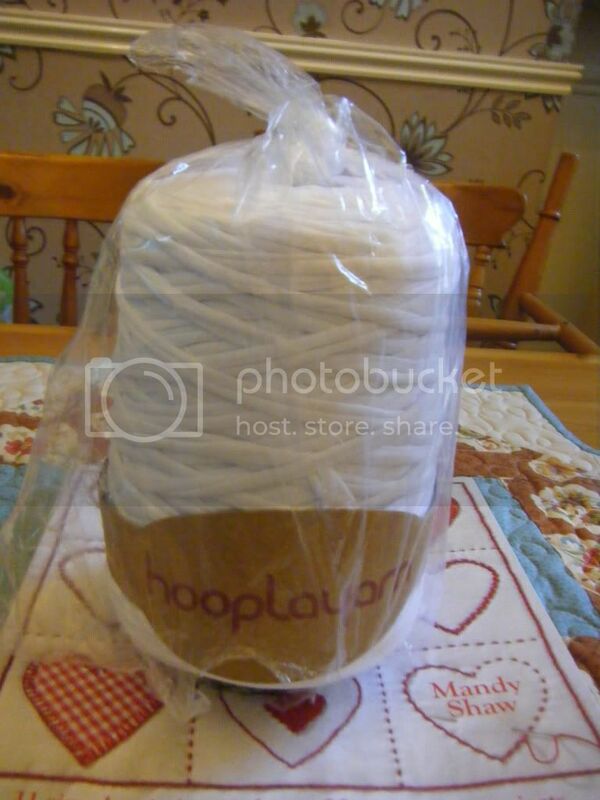 Glad you got some of the Hoopla yarn too! It's fab!! Can't wait to see what you make with yours too.